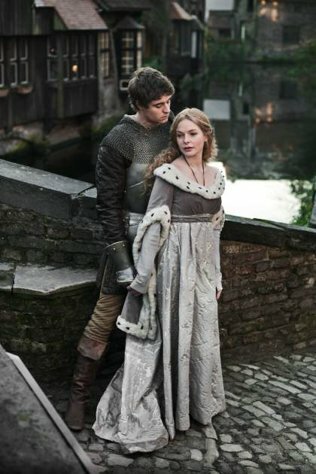 The White Queen tells the real-life story of Elizabeth Woodville, the commoner queen of England’s Edward IV. In the midst of the Wars of the Roses, Edward, the scion of the house of York, falls in love with the bewitching beauty when she waits by the roadside to plead for her sons’ inheritance. After that pivotal moment, Elizabeth’s entire family switches sides from the deposed Lancaster king Henry VI to the Yorkist faction, setting in motion a chain of events that lead to joy and loss, and eventually to the end of the family conflict that has torn England in two. The BBC series relies mainly on the first book in Philippa Gregory’s Cousins’ War series, but also draws from its companions – The Red Queen, Lady of the Rivers, and The Kingmaker’s Daughter – to tell the stories of the other female players in the game of royal intrigue: the hyper-religious Margaret Beaufort (mother of the future Henry VII), Elizabeth’s mother Jacquetta of Luxembourg, and Isabel and Anne Neville, the daughters of the Earl of Warwick, the man who put Edward on the throne. So far I’ve been impressed with how well the show has followed the books, staying true to history while bringing events to life, and weaving several opposing stories together seamlessly. The casting is absolutely perfect. The costumes and settings are sumptuous. Even my husband is getting into the story, asking questions like “does he die?” and “what happens to her?” For the first time since Game of Thrones season 3 ended, I’m excited about Sunday night TV. Speaking of Game of Thrones, fans of George R. R. Martin’s fantasy epic might have a sense of deja vu while watching The White Queen. After all, he has admitted to basing his series in part on the true events of the Wars of the Roses. While you won’t see any white walkers in Medieval England, and the content is much, much tamer, “Thronies” will likely enjoy this real historical game of thrones. One wee disclaimer: in history, Elizabeth and her mother were accused of using witchcraft to control the king, and Gregory has decided to lend the rumours some credence in her portrayal of the Woodvilles. While the magical content is more of a footnote to the story, it might make some audiences uncomfortable. However, as a redeeming quality any magic that Elizabeth and Jacquetta use always has consequences, and as any student of history knows, it does not go well for them. If you’re lucky enough to live in the UK, you can catch this show on Sunday nights on the BBC. In the US, the series will be airing on Starz beginning later in the summer. Fabulous! I love that period of British history and from the pictures the background and the costumes are great..Not in the UK or US though. Fingers crossed we will get the series eventually. How exciting! I’ll have to check this out. I also loved The Tudors, despite the glaring inaccuracies. 😉 Too bad about not getting the channels. 😦 But there are ways to get a hold of things – even renting the season on DVD eventually or borrowing it from the library. Thanks for the recommendation on George R. R. Martin’s short fiction. I’ll have to check that out.